I’ve been a writer almost as long as I’ve been a reader; probably longer in fact, if you count the toddlerhood imaginings that I didn’t have the technical knowhow to turn into written words. Throughout my schooldays and teens I read and wrote voraciously; my imagination stuffed to overflowing with ideas. When I started work and life became busier there was less time to write, but big things, important things, special things would still inspire a story or a poem. As time went on though, I wrote less and less, my thoughts cluttered with everyday stuff until, one day in 2003, I found myself sitting on the Tube staring at a soft drink advert. Its six word tag line ‘At lunchtime I feed the unicorn’ hit my imagination like a defibrillator, filling my head with a fully-formed short story which I spent the rest of the journey home scribbling down. It reminded me just how much I loved writing and, a couple of months later, I quit my role in Facilities Management to seek a job that would allow me to reclaim some of my creativity. I became an admin assistant with the NHS and for the next eight years wrote anywhere I had a few minutes to spare; on the bus, sitting in waiting rooms, through my lunchbreaks etc. and I began to have some small successes in poetry competitions, and occasional pieces published. it has five wheels so thinks that it should lead. (a Charleston, jive or quickstep just won’t do). before you set off upon your trip! I also took the plunge and submitted some poems to a small publishing company and, in February 2012, they requested a full manuscript. I asked if they could wait three weeks as I was about to start radiotherapy, they said yes. The manuscript went off in March, just after my oncologist had uttered the most perfect line of iambic pentameter ever - ‘As far as we can tell you’re cancer-free’ - and in May I was offered a publishing contract. 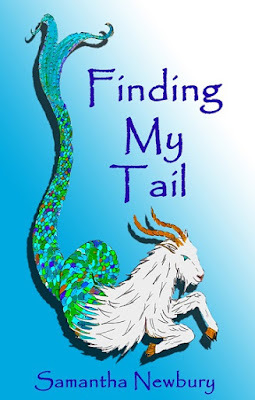 Finding My Tail came out on 8th July 2013, by which time I’d taken redundancy from my NHS job and was officially a self-employed writer/artist/craftswoman; I felt incredibly fortunate. It was about this time, however, that I began to notice the gradual dulling of my imagination which persists to this day. The combined effects of chemo, Tamoxifen and menopause create a numb fogginess, and have drastically lowered my attention span and reduced my short term memory to minutes. Nowadays, the wonderful ideas for stories and poems no longer bubble over the edges, I have to hunt for them in the fog. Sometimes a perfectly formed idea appears, shimmering like a rainbow, only to burst as I reach for it, leaving nothing but a vague dampness of memory. If I do capture an idea, my ‘forgettory’ and limited attention span mean I frequently get distracted and the threads of the piece unravel. Writing is now a real effort – some days my entire mind is cloudy and I feel almost physically disoriented and dizzy. On those days I can barely string two words together, let alone write a poem worthy of competition entry or publication. 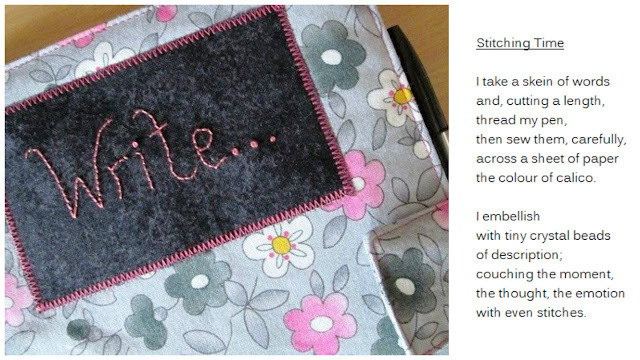 I’ve learned not to attempt to write on the really bad days, turning instead to art and needlework that, being visual and physical are still achievable, allowing me to retain at least some of my creativity. The fear that I may never be able to write ‘properly’ again looms terrifyingly large in the shadows, because if I can’t write how can I be a writer and, if writing is an integral part of my resilience, how can I be resilient if I can’t write? I do try to write on good days and aim for a minimum of two poems a month. I use writing prompts a lot to kick-start the process (thank you Visual Verse website). A picture, word or idea prompt gives me a defined focus and a time limit/deadline around which I can structure thinking and writing time. I have recently realised, however, that I’ve become so scared of not being able to write, that I’ve got cagey about actually doing it. This has to change, because if I don’t write I won’t be a writer and my resilience will start to develop holes. When I first saw Panning for Gold I was a bit wistful. I’ve never blogged and couldn’t remember the last time I wrote a longer piece of prose. I figured it would be yet another idea that melted into the fog. But this morning there was a sudden bubble of inspiration and, for once, I actually managed to catch it. And I realise now that, if I get an idea, I have to grab it and run with it, no matter where or when it occurs; which means most of this piece has mainly been written, between bites of toast and gulps of rapidly cooling fennel tea, standing in a freezing kitchen in my dressing gown. Because, you know what, I am resilient, I am a writer and the after-effects of cancer won’t be getting any more of my precious soap bubbles without a fight.